If you own a small yard, it is not practical for you to grow large trees. But that does not mean that you can't grow your own fruit. By planting dwarf fruit trees, you can have an attractive landscape suitable for a small property, while also enjoying the fruits of your labor at the dinner table. 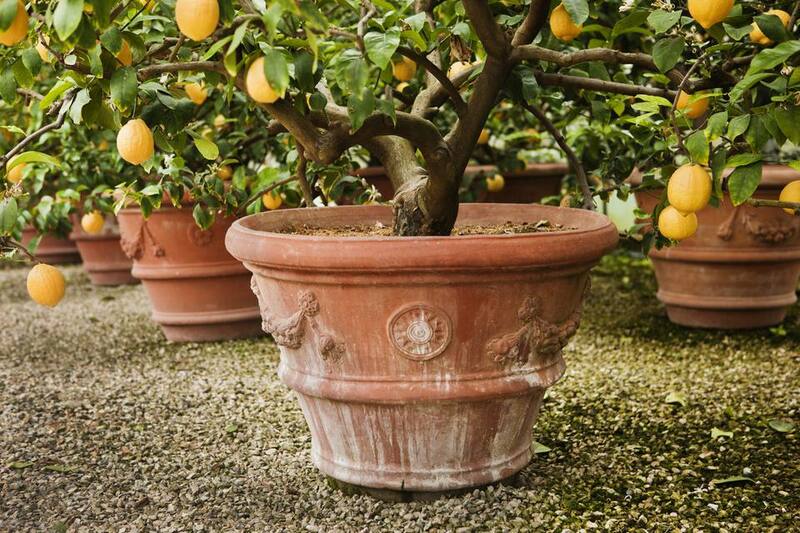 Even if you are forced to garden entirely on a patio, you can still grow some of the smallest of these specimens (such as dwarf lemon trees) in pots. 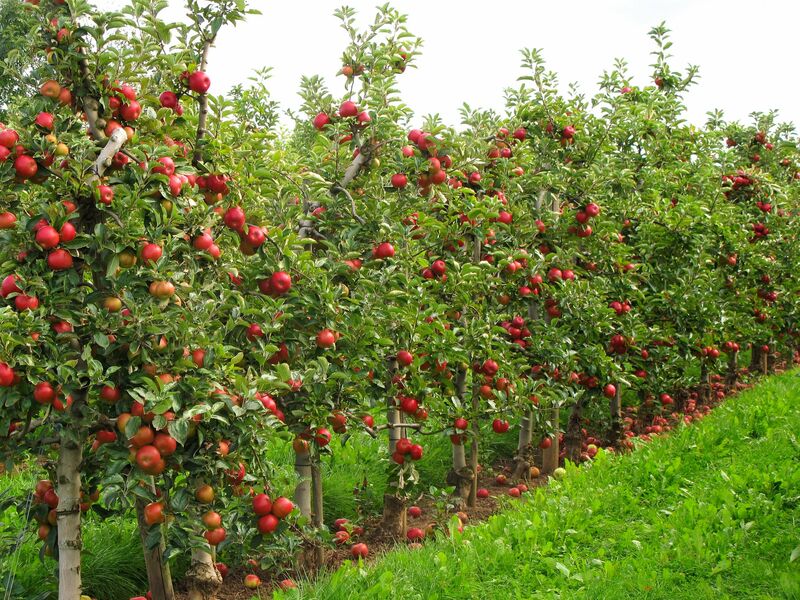 There is one "catch" that beginners should keep in mind: Some fruit trees are self-fertile, but many others are not. For the latter, you will need to grow more than one tree to achieve pollination. Make it a point to ask nursery staff about this when buying. All of these entries prefer full sun and well-drained soil. The first four trees in this list, beginning with dwarf apple trees, all belong to the large rose family, which also includes ornamental landscape plants, such as flowering quince shrubs (Chaenomeles speciosa) and Washington hawthorn trees (Crataegus phaenopyrum). A popular dwarf apple tree is the Cameron Select brand of the Honeycrisp. It matures at 8 to 10 feet tall. Apple trees are among the hardiest of fruit trees; this one grows in USDA plant hardiness zones 3 to 6. This dwarf bears bright red fruit that is sweet, crispy, and juicy. For a semi-dwarf cherry tree (Prunus avium), look for a Stella graft that uses a Colt rootstock. The tree will reach a mature size of just 10 feet tall. This plant is suitable for zones 5 to 9. The fruit is a dark red color and sweet. Cherries are self-fertile, so you do not need to worry about providing a mate for pollination. This fact makes them even better suited to small yards than are those fruit trees that need a separate pollinator. Peach trees are also in the Prunus genus (P. persica). Apricots, cherries, peaches, and plums are all known as "stone fruits" because they have a pit inside their fruits. Also like cherry trees, peach trees are self-fertile. Belle of Georgia is a dwarf peach tree that reaches 8 to 10 feet tall. As delicate as they appear, peaches are actually quite hardy; Belle of Georgia can be grown in zones 5 to 8. It is a white-fleshed peach that is firm, sweet, and juicy. The skin has a red blush. There are a number of dwarf plum trees. If you want to go really small, there are even types of shrubs that bear edible plums. One such shrub is the natal plum (Carissa macrocarpa), which can be grown in zones 9 to 11. It usually reaches 8 feet tall. For colder climates grow the beach plum (Prunus maritima), which is hardy to zone 3. The beach plum is the 6-foot bush that many residents of the northeastern United States will recognize as the fruit-bearing plant that inhabits the sand dunes along the Atlantic Ocean. An example of a dwarf plum tree cultivar is Prunus domestica Johnson. It grows in zones 5 through 9 and typically reaches a height of 10 feet. Johnson has a red skin and sweet red flesh. It needs a pollinator, though; as an alternative, grow the self-fertile Damson plum tree. Although we say banana "trees" in everyday language, scientists actually refer to bananas as herbaceous plants. In fact, they are considered the largest herbaceous flowering plants on earth. Space-conscious gardeners should not let that worry them, though: There are small banana plants (Musa spp.) suited to small yards. The dwarf Cavendish banana tree is 8 to 10 feet tall. Grow it in zones 9 to 10. The fruit is sweet and 3 to 6 inches long. The big, tropical leaves lend aesthetic value to the landscape. It is self-fertile. Its fruits may not look like the lemons (Citrus limon) you buy in the supermarket, but the dwarf Meyer lemon tree is one of the best varieties you can grow if you want to produce fruit in a small space. Their lemons are rounder than typical lemons and have some orange color mixed in with the more usual yellow (but they do have the tangy taste that you would expect from a lemon). This tree is suited to zones 9 to 10. The fragrance of the white flowers is a nice bonus. It grows 4 to 6 feet tall and you can produce lemons with it in your backyard without buying a separate pollinator. Oranges originated in China, a fact demonstrated by the botanical name, Citrus x sinensis: That sinensis is Latin for "pertaining to China." Many people wonder whether the fruit or the color first received the name, "orange;" the answer is that the fruit did. Dwarf Calamondin orange trees (zones 9 to 11) are self-fertile and grow 6 to 10 feet tall. They are great plants to grow in patio pots for citrus lovers, but their flesh is not as sweet as the flesh of the more common oranges (the fruit is more likely to be used in the making of marmalade, etc.). Still, they cut a striking figure, so they are worth growing for their ornamental value alone. As a bonus, the blooms are fragrant. If you desire sweet, orangey-tasting fruit from a dwarf tree, tangerines are a better bet than true oranges. Citrus reticulata (zones 9 to 11) is valued for bearing fruits that taste a bit like oranges but are much easier to peel and much less messy to eat. A nice thing about growing tangerine trees in a small space is that their natural height of 10 to 25 feet can be kept at the low end of the range simply through trimming, so there is no need to seek cultivars that are specifically "dwarf." They are self-fertile. Ficus carica is self-fertile. You can keep it outdoors all year long in zones 8 through 11; in colder climates, it is easiest to just grow it in a pot and move the container into a sheltered spot for the winter. Surprisingly (considering its association with warm climates), the fig does have a chilling requirement, but it is less than 300 hours of sub-45 F temperatures. Celestial is a dwarf type that bears small fruits with a sweet flavor, and grows to a height of about 10 feet. Fig trees work well in containers because they like having their roots constricted, which is exactly what happens to plants grown in pots ("rootbound" plants). Their foliage is attractive enough to offer ornamental value, to boot. The taste of pomegranate seeds is a curious sweet-sour mix, but the pomegranate is not just a novelty found in grocery store produce sections; it is a storied fruit. "Pomegranate" literally means "seeded apple" (from the Latin), a reference to the Romans' observation that its outward appearance was like an apple's, while it bore many seeds inside. The Romans may have supplied us with its name, but the pomegranate is most famous culturally for its connection to Greek mythology. The Greeks had a myth involving Persephone, Demeter, Hades, and a pomegranate that explains why we have winter. Punica granatum is deciduous and variously referred to as a tree or a shrub. That is because specimens range from being 3 feet tall and bush-like to 20 to 30 feet tall and more tree-like. They are self-pollinating and suited to zones 7 to 10. Dwarf versions 8 to 10 feet tall are available, but their fruit is smaller than what you are used to. Fruit Tree Not Fruiting? Put on Your Detective Hat! Do Any Fruits Have Seeds on the Outside? What Kind of Citrus Fruits Can I Get? Why Don't My Fruit Trees Bear Fruit? Have You Tried These Tropical Fruits? Add Something New to Your Plate! Growing Lush Berries in Containers. What Should I Know About Growing Tomatoes? Is It Possible to Grow Apples From Seeds?